When I was a young boy, I remember learning about Mickey Mantle. I lived in Anchorage AK in my early years and it was often cold in the house. I remember the smell and sounds of burning wood in the fireplace. It was an innocent time and I was learning to think of the important things. I'd look at that shelf above the fireplace, the mantel, and it would remind me of Mickey Mantle. Growing up, I would hear numerous stories about Mickey Mantle from collectors and general baseball fans. I would even go on to read and thoroughly enjoy the book, 7: The Mickey Mantle Novel . Mickey Mantle baseball cards have always seemed out of my reach. In a way, owning even one card felt more like realizing a dream. Yea, I suppose it all comes down to funding. The fact of forking over $350+ for a single card was just a bit more ambitious than I'm often able to accommodate. This changed as I got older and acquired more funding. Due to the onset of card grading, I could now get one in a much more desireable price range. By this time, I knew I didn't want to purchase anything in high grade because condition, in a lot of ways, doesn't really concern me. What I've grown to care about most is centering and completeness, which relates to the fully intact baseball card. I like character so soft corners and rough edges are fine with me, if not in a way encouraged. For my birthday one year I decided to buy myself my first Mickey Mantle baseball card. I wanted a PSA1 so I started to search around for them. 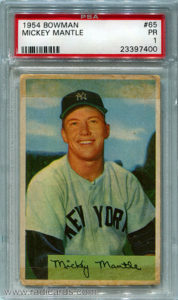 Sometime later, this 1954 Bowman Mickey Mantle surfaced and it was just perfect. The tape residue along the top and bottom edges really adds a degree of character that tells a story. I can picture how this card was displayed and enjoyed so long ago. Another thing I love about this card is the centering; it's nearly perfect. As I've matured as a collector, I've focused less on the grade assigned to the card and more on the eye appeal quality of the card itself. This has been much more important to me in recent years. This makes collecting more interesting while at the same time somewhat more difficult but that's not at all a bad thing. I say this because an increase in scrutiny means less frequent purchases, which is always good for the budget. As a result, the overall quality of my collection is much more appealing because every card is appreciated just like this 1954 Bowman Mickey Mantle . I love getting Mantle cards when I can. I also collect low graded cards and usually the subset cards, no checklist or team pics, because they are cheaper. I think I have 15 or so now and never paid more than $30 for one. My favorite is probably the 1958 Topps #487. Oh yea, the ’58 Topps All-Star card; a classic indeed.